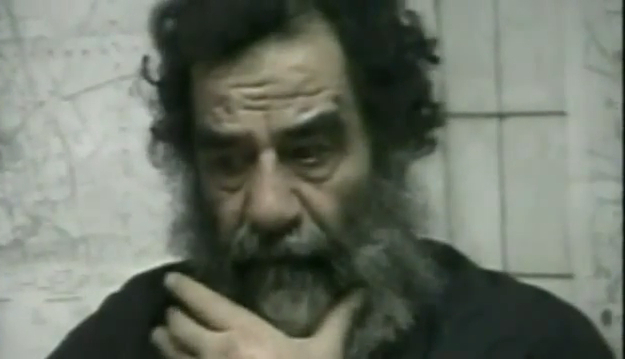 Still, the way the US government and media used the images of Hussein as a captured animal, broken, shorn of his power and presented on screen as an object of physical examination betokens a desire to put the vanquished enemy on parade. 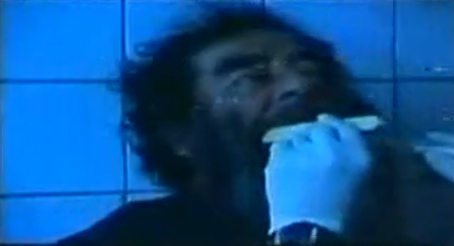 The images of the medical examination undoubtedly served as a tool of psychological warfare for US forces within Iraq, meant to dispirit the former president’s supporters by showing his degraded state, while seeing Hussein this way cheered those who were persecuted under his regime. The images also circulated widely in the West, becoming the subject of much mockery in the US. In this context, President Obama’s decision not to release gory photos of a dead Osama Bin Laden seems like a wise one, motivated by a desire not to satiate everyone with every graphic detail of the country’s great and wonderful kill. But still, the impulse to humiliate a defeated foe remains strong in our culture. Osama Bin Laden was a malicious person who undoubtedly had the blood of thousands on his hands, but something still seems wrong about hooting and hollering over the death of another human being. We don’t put bleachers and cheerleaders on death row, even if the worst person is being executed. With this in mind, the government’s decision to release Bin Laden’s “home videos” is a curious one. The footage is clearly designed to make the terrorist seem like a pathetic figure, obsessed with his own image and even neurotic in his hatred of Barack Obama. He sits wrapped in a shawl in a desolate room, watching a tiny TV and flipping the channel whenever Obama appears on screen. Bin Laden’s beard has apparently grayed to the point of whiteness, yet, as ABC News reminds its audience, he dyed it black to appear in videos for public consumption. The New Yorker’s Lawrence Wright, who wrote an acclaimed book on Al Qaeda, told ABC that the videos reveal Bin Laden as “a guy who wants to be seen and wants to be known” which “is very pathetic in a way.” He is like any reality TV star, from The Real Housewives of Atlanta to Big Brother – hungry for attention, living an aimless life in the lap of luxury, as desperate to control his image as Jon and Kate or a Real World cast member justifying his actions to the camera. This is the dreaded terrorist: a vain wannabe with a webcam. Former counterterrorism official Richard Clarke sees the maneuver for what it is. “This is part of a US government effort to discredit him after his death,” Clarke said recently, “so that he doesn’t become a martyr in the eyes of Arab youth.” But it is not just potential jihadis who are the audience for this spectacle. 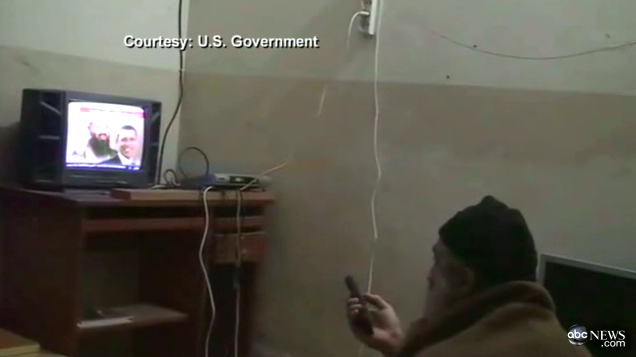 Abbotabad’s Funniest Home Videos allows us to see Bin Laden as a much smaller figure. He is no longer in control of his image, unlike in the past ten years when he dictated how and when the world would hear or see him. He is not the sage-like figure, sitting cross-legged with his aides in a cave, always with a Kalashnikov carefully placed by his side. He is just a couch potato in the suburbs. The US government has every right to release these videos, but national security cannot be the sole reason why they choose to release some snippets and not others. We would like to believe Bin Laden was as a sad, lonely, desperate figure, as concerned with how we see him as we were with what he and his minions might do to us. The Onion nailed this sentiment with its headline “Osama Bin Laden Killed while Sitting on Toilet, Nation Likes to Imagine.” I certainly wondered what Osama was doing in that compound for the last five or six years. Was he sitting watching Say Yes to the Dress: Big Bliss, eating Cheetos, and laughing at the brides-to-be when they burst the seams of their sample dresses? The US media, as well as the government, would like us to believe Bin Laden was some self-absorbed new media star, a YouTube celebrity obsessed with his own hair. Video, cell phones, TMZ, and the government’s own press operation all help us see the mighty brought low, immortalized in unguarded and embarrassing moments. That this is how we want to see our official enemy says as much about us as it does about the enemy.